COOL SEWING THINGS Did not know what to post today. No new pic’s to show you. So went thru a few olddies and found these. To cold yet to go out and work on anything. Only 34 this morning! Gathered up these the other day. I want to use them in some art project. Just now sure what. I found these pic frames at a yard sale couple years ago. They just lived out in my room for a year or so…than last year…when in a funk…I was getting rid of all art/craft stuff. So I gave them away. Now funk gone and I want to get back to work and they are gone …boo hoo…oh well….I even went so far at one point in time to paint them black. This was taken a couple years ago at my house in PA. Some Knock Out Roses mixed in with some pink climbers. They are on the side of my front porch. Little Maggie is in there somewhere…. Some very pretty hand made flowers. I made some of them and got a few in swaps. Loved doing swaps…hope to get back to them sometime soon. Pretty colors too. And how about this pretty cool girl? 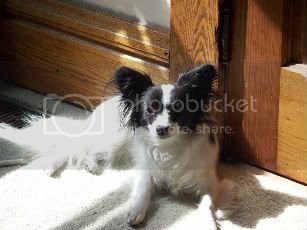 My Maggie girl…you have to click on the pic to see how pretty she is!!! Not much that’s for sure. Did a few things yesterday you can check my other blog to see what. I am trying to spice up the look of my blogs with out changing the format. I really don’t want one of the new ones with all the bells and whistles.Jus slows things down I think. Both my kids have BD’s this month I am making my DD’s card and need to send it out tomorrow…not sure DS would want a handmade sissy card lol. Got a ton of ideas for some new stuff to make and sell…wish I could find some of the smaller printer drawers. I know that when I get to PA this summer I am going to hit the yard sales and flea markets hard looking for stuff for all my new ideas. So I don’t have much to show you want I am working on but will soon. This and that about me. I am a retired mom of 2, grandma of 4 and lived in western Pa all my life. Now spending most of my time in Florida with my dad. Love to flea market and yard sale. Geocaching, and crafting on my list also. Had a country store for last 15 yrs and worked 25 yrs in a hospital before that. Now I want to start traveling/camping some. My stick pins for the swap. NORMA E. WITH HER STICK PINS! Made some charms and pins. Maggie in her fav spot!